Pressure is mounting on Sinn Fein to take its six seats at Westminster ahead of crucial votes on Brexit. The pressure from Taoiseach Leo Varadkar as well as politicians in Fianna Fail and Labour follows British Labour Party leader Jeremy Corbyn’s widely-publicized speech on Monday calling for the U.K. to remain in a customs union with the EU. Such an arrangement could avoid a return to border controls in Ireland post-Brexit. It’s believed that some Conservative MPs could support Labour’s position in a House of Commons vote on future customs arrangements. Given British Prime Minister Theresa May’s lack of an overall majority, and her reliance on the Westminster 10 Democratic Unionist Party MPs for support, the result of any vote on the matter is likely to be close and could hinge on Sinn Fein’s six seats. A seventh is vacant following the resignation of Barry McElduff in January after claims he mocked the Kingsmill massacre 42 years ago. Sinn Fein have already elected 26-year-old solicitor Órfhlaith Begley to contest the by-election in West Tyrone on a date yet to be set. Sinn Fein has never taken up seats in Westminster since its first MPs were elected in 1917. They still refuse to swear allegiance to the Queen and do not recognize the legitimacy of Westminster’s rule over Northern Ireland. Sinn Fein insists its abstentionist position remains. 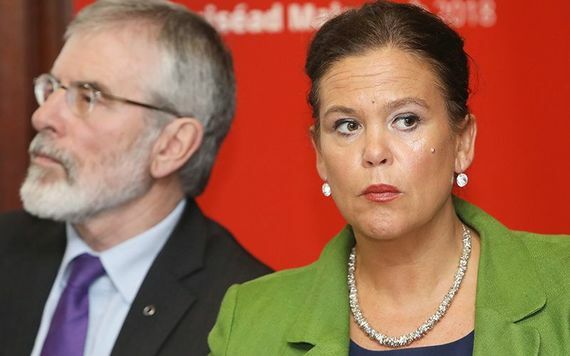 Party leader Mary Lou McDonald refused to answer questions on the issue while she was attending an event in Dublin on Monday.